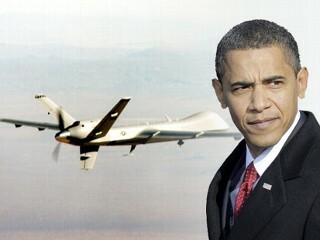 "OUR DRONE PROGRAM IN OTHER COUNTRIES IS LEGAL BECAUSE WE SAY IT'S LEGAL." There you have it (source). Now stop asking your questions and re-elect Barack Obama. "We continue to believe, based on the information available, that the program itself is not just unlawful but dangerous," Hina Shamsi, director of the ACLU National Security Project, said. "It is dangerous to characterize the entire planet as a battlefield." Perhaps the single-most disappointing political consequence of the Obama Administration is the tacit approval by most progressives to acquiesce to the very same outrageous military aggression of the Bush Administration - which had prompted widespread protest and dissent. Cowed into submission for fear of electing Republicans, Democrats seems as eager as ever this election year to shore up a president whose military policy continues or escalates the same hawkish postures of his Republican predecessor. And this is precisely what the military industrial complex needs for its continuation. In related news: support the ACLU. "Yes we can... bomb whomever we want anywhere in the world."